Babem is a bubblely, adventurous girl. She is curious, affectionate, and at times mischievous or vulnerable. As she embarks on the great adventure of growing up, she is learning how to assess conflicting values arising from a tumultuous multi-cultural childhood. 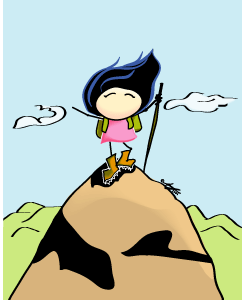 Babem is an avid extreme sports adventurer, she likes to paraglide, snowboard, hike up mountains, and just be outdoors. Her other loves include ballet, drawing, and hanging out with her boyfriend Boyee. She likes to talk about just about anything, science, gossip, politics, and parents. In between school and hanging out with Boyee, she works at a coffee shop, the Last Stand. She has a pet Badger, nicknamed "Badgee". She also has a little doll named Angie-Doll. One can never be too old for one's favorite doll! Babem's mortal enemy is the "Blond bimbo", a.k.a. Bianca Blond. Ms. Blond doesn't work for a living, and spends her parents' money, usually at the Last Stand.